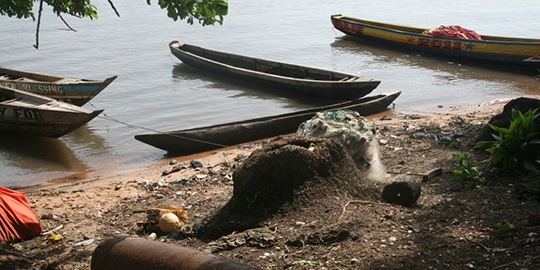 A cannon relic rests on shore in Sierra Leone at the site of an 18th-century British slave trading fort, a research site for many years for Professor Christopher DeCorse. The boats are smaller versions of the one he fell from. It was just supposed to be another routine boat trip. Professor Christopher DeCorse had made the trip from Bunce Island in Sierra Leone to nearby Papel Island many times over the span of many years as part of his research work. But one day last June, the journey’s end turned into a harrowing experience. The Maxwell School anthropology professor, his colleagues and graduate students were returning as usual to their field camp from the remote Bunce Island after a day excavating at the site of an 18th-century slave trading fort. As he jumped off the boat to the rocky shore, a wave rocked the boat, causing DeCorse to fall awkwardly and break his right leg. What followed was an arduous, painful five-day trip back to Syracuse, involving at times rudimentary medical care, medevac helicopters and a heavy plaster cast. His experience was made more manageable, however, by the resources of International SOS (ISOS), a company contracted by SU to provide medical and travel security services around the globe to faculty, staff and students. The University contracts with ISOS as a service for faculty, staff and students while they are traveling on official university business or programs, says Dan Wears, manager of emergency management and business continuity planning. “ISOS provides international medical and security assistance, ranging for pre-trip information—on such things as vaccinations you should receive before visiting a country, potential security risks in country, cultural sensitivities for different countries—all the way up to emergency medical and evacuation, if needed,” Wears says. There is information on more than 200 countries and 300 cities that is updated regularly. Even more importantly, the University-specific site (http://internationalsos.com/MasterPortal/default.aspx?membnum=11BCPA000177) allows travelers to input their travel information—flight, hotel, travel length and other details—and register their trips. The information is available to only a few people at SU and at ISOS in case of an emergency or a situation in which the traveler needs to be notified or contacted to verify their safety. “It allows the University and ISOS to be proactive. Whether it’s a security issue or an earthquake, we can log into our portal, and we can get a picture of all of our travelers. Then we can touch base with them with whatever contact info they have provided to make sure they are OK,” Wears says. Secondly, the site allows travelers to input medical information. This information is only available to ISOS doctors; no one at the University has access to it due to Health Insurance Portability and Accountability Act (HIPAA) laws, Wears says. In case of anything from a prescription refill to a medical emergency, the traveler’s information is available for the ISOS doctors to help coordinate care. In addition to medical information, travelers can upload scanned copies of travel documents and credit cards in the event they are lost or stolen. ISOS also has prescreened doctors and facilities around the world and even some of its own clinics to refer travelers to or make appointments for them, Wears says. Other services include medical translation services and legal referrals. An SU membership card with SU’s member number and toll-free number is available by contacting Wears. There is also a downloadable app on the ISOS website to get alerts and access the website. “People say, ‘It won’t happen to me,’ but we want people to be able to get the help they need and be prepared,” Wears says. SU faculty, staff and students logged 200,000 travel days last year and ISOS helped with 73 cases. Immediately after his accident, DeCorse was taken by motorcycle back to the field camp, where he waited about five hours for a rented vehicle to take him to a hospital in Freetown. DeCorse had notified his wife in Syracuse, who contacted their health insurance and ISOS. Once at the hospital, ISOS arranged for payment in cash for services, which included the emergency room, an X-ray and resetting his leg. An ISOS-arranged medevac helicopter airlifted him from Freetown Airport to Dakar, Senegal, where better medical facilities were available. From there, ISOS scheduled a flight for him, accompanied by a Senegalese doctor, to Washington, D.C., the earliest flight to the United States, and on to Syracuse directly by ambulance due to his immobility. Seven days from the time of the accident he was in surgery at Crouse Hospital. 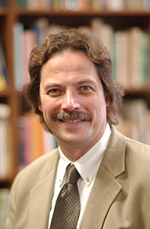 DeCorse, who received much support from Senior Associate Dean for Academics and Administration Michael J. Wasylenko and Dean James Steinberg, was able to postpone a planned sabbatical this year and is now teaching a class as he recovers with physical therapy. There’s still work to be done in Sierra Leone, where the students and a colleague had located some interesting artifacts. “I planned to visit the sites and analyze what was excavated that would lead them through their work. I was only there a week, so we didn’t do any of that,” DeCorse says. 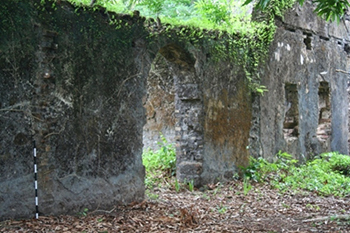 The remnants of an 18th-century British slave trading fort in Sierra Leone, where Professor Christopher DeCorse has been doing research for many years. He hopes to return to Sierra Leone next spring or summer to do the analysis. “My wife has told me she’s coming with me as a guard,” he says. DeCorse encourages others to use ISOS as a planning resource. To access Syracuse University’s specific ISOS, visit http://www.internationalsos.com and enter the login 11BCPA000177.